This is a story about the fall of Russia’s Romanov empire, written by well-known novelist, Kathryn Harrison. Set in St. Petersburg, 1917, a lot of it takes place in the lavish imperial palace of Tsar Nicolay and his family. It opens, however, with the murder of the Mad Monk, Grigory Rasputin, who was drowned in the Neva river by the rising Bolsheviks. This notorious healer had grown close to the Tsar’s wife. When he was killed, she persuaded Rasputin’s daughter to move in to the palace and help look after her hemophiliac son. The rest of the book is their story, of their growing together as they watch their whole world come crashing down. There are many reminiscences looking back to voluptuous days when the Tsar ruled Russia. 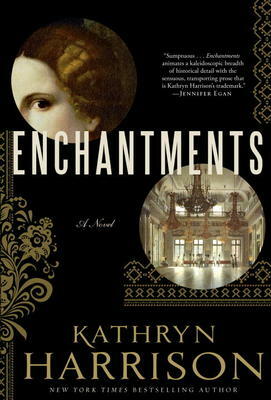 These “enchantments” give way to a closing down of the palace and eventual execution of the Romanovs. Harrison is skilled at creating a vivid, imaginary world, based on historic fact. She has done this in novels such as: Thicker than Water, Exposure, Poison, The Binding Chair, The Seal Wife and Envy. She has also written autobiography, biography, and a book of crime. Previous Previous post: R. J. Harlick and Lesley Harman to Sign Their Books on Saturday, March 17! Next Next post: Events coming up in April!